Last Tuesday (3/31), Carol and I said “See ya later” to our friends and co-workers at Amarillo Ranch RV. We enjoyed our time there and made some new life long friends. 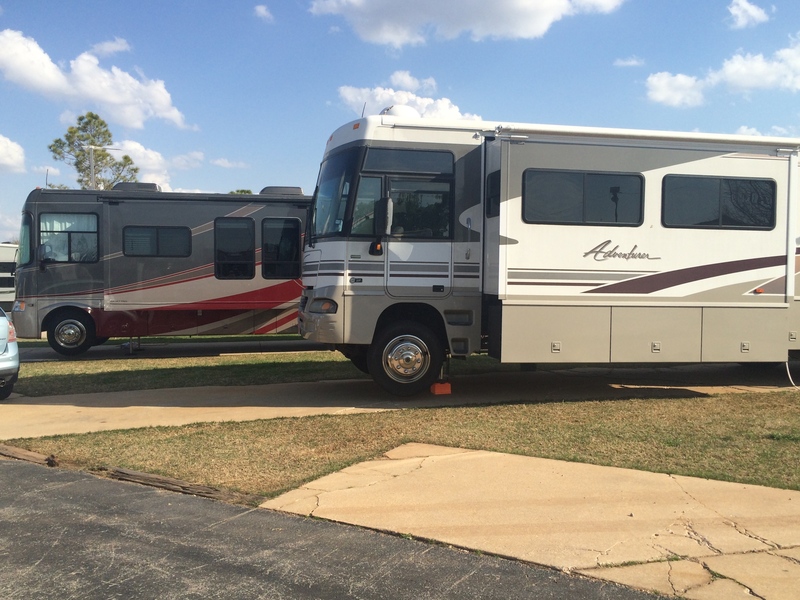 If you are in the Amarillo area and need an overnight stop for your RV, be sure to stop by Amarillo Ranch RV. They have easy access to I-40 and friendly staff. Our new destination is 1500+ miles to the east in Virginia. Our first day took us to Oklahoma City about 259 miles away. 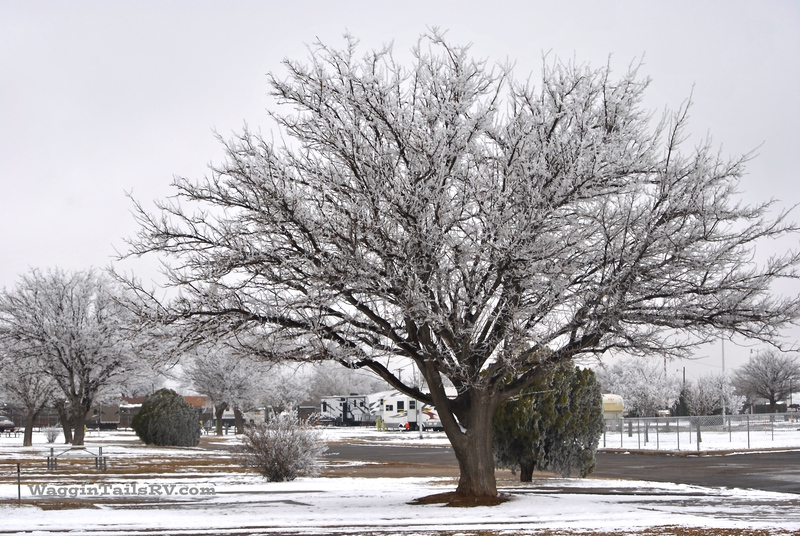 We stayed at Roadrunner RV Park a little south of I-40. 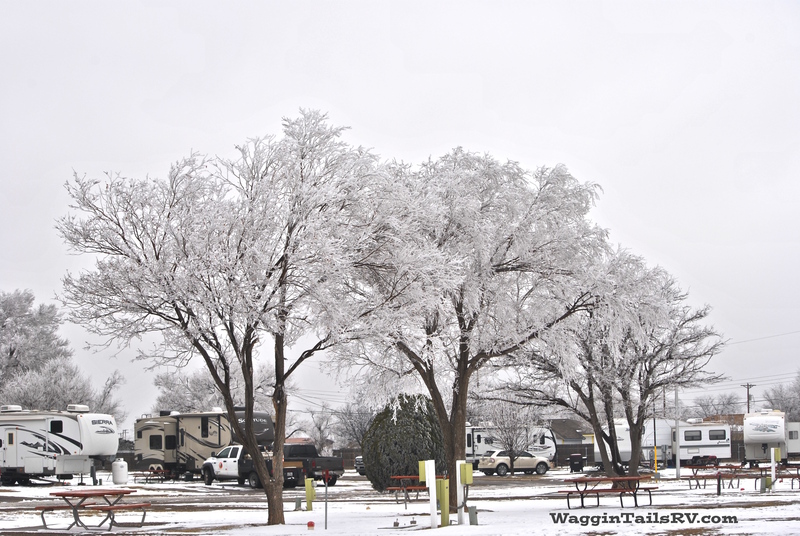 This is an older RV park which means the RV sites were close together and the roads in the park where tight and narrow. Our site was so low in the front that when we leveled the RV, our front tires where off the ground. For a one night stand, that is OK even though it is not desirable. The clerk on duty did not know anything about the coming storm. He did say if the wind got bad, we could go to the restrooms (no pets allowed). If the tornado siren sounded, we could go to the underground shelter (no pets allowed). After we got set up, we ate left-over Italian from Sunday afternoon late lunch. We watched the local weather report and paid attention to the weather on my phone. We knew the weather was going to get rough over night but did not know the timeline for that. We went bed figuring we would just ride out the storm as we had done many times before. About 11:45 we felt the wind rocking our RV and heard the pounding rain on the RV. Carol was already up. The rocking woke me up. Obviously we were a little concerned because we had not experienced weather this rough in a while. A few days prior to our arrival in Oklahoma City, a small tornado touched down about 9 miles south of where we were staying. Oklahoma City area is prone to tornadoes in the Spring so we were being cautious. I captured an image from my weather AP on my phone at 12:15AM. We are the blue dot. 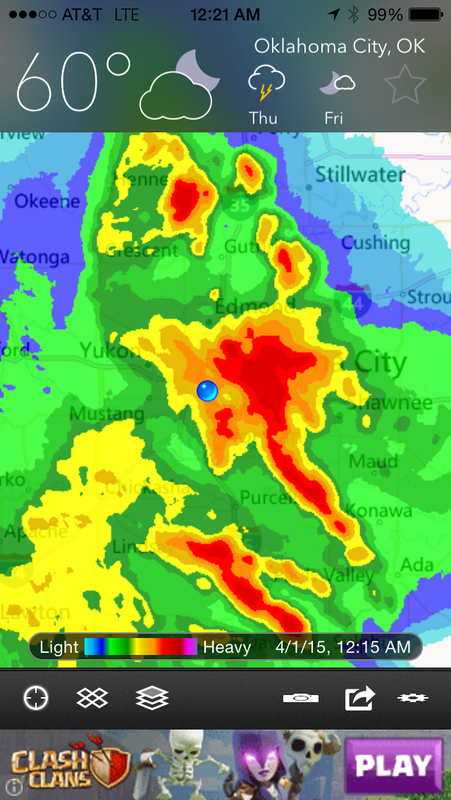 To the right of the blue dot, you can see the dark red center of the storm cell. This was the source of the heavy wind and torrential rain we endured. We did not hear of any major damage in the park or our area. I think we dodged a bullet. Carol and I are strong believers in the power of prayer. In the Bible, there are a couple of passages where Jesus commanded a storm to stop. (Matthew 8:23:27 and Mark 4:35-41). Every time we encounter a major storm such as what this was, our prayers are for God to quieten the storm or move it away. Then we always ask for God to protect us. Then we follow our hearts. Col 3:15 says: Let the peace that Christ gives control your thinking, because you were all called together in one body to have peace. Always be thankful. Our hearts were saying to stay put, so we did. The RV shook like crazy and the rain and hail pelted us pretty hard. By 12:30, the storm had passed and we went to bed. In the morning, the sun was shinning and we found no damage to the RV or our car. God had once again heard our prayers. He protected us from the storm. 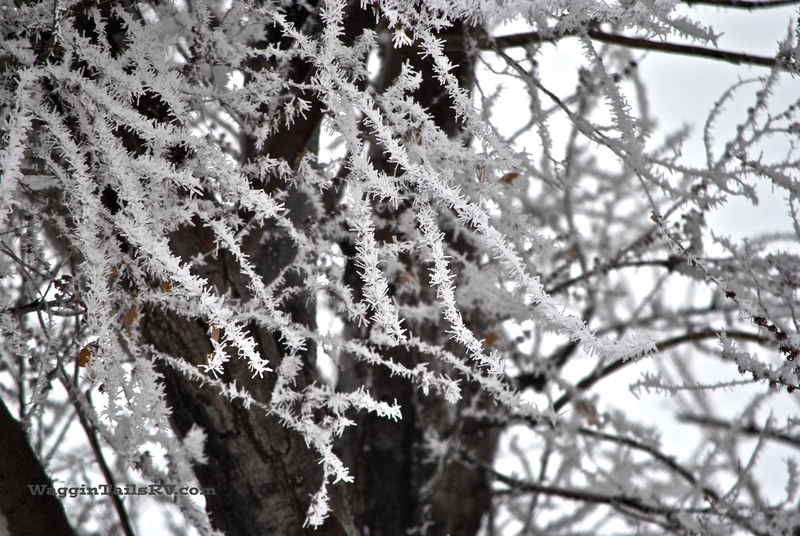 Freezing fog occurs when super chilled water droplets in the air freeze when contacting a frozen surface. 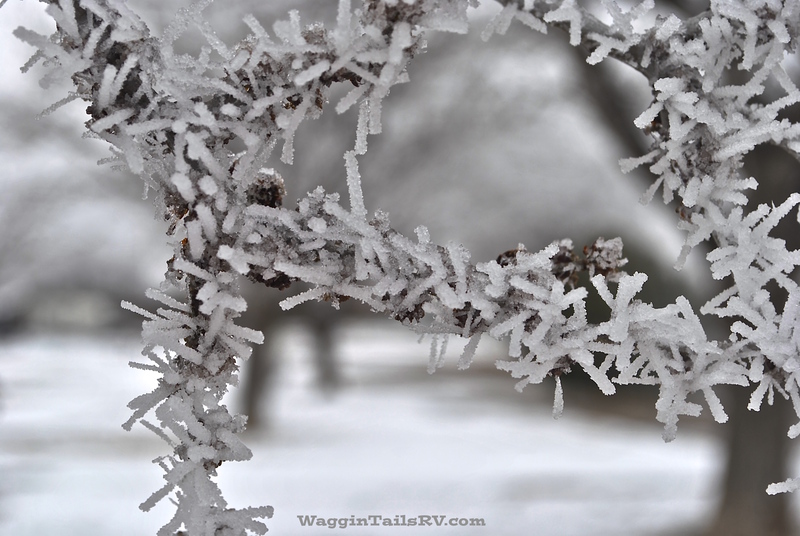 Some times this creates a slick sheen of ice and other times it creates a crystalline structure. Such was the case on Sunday. 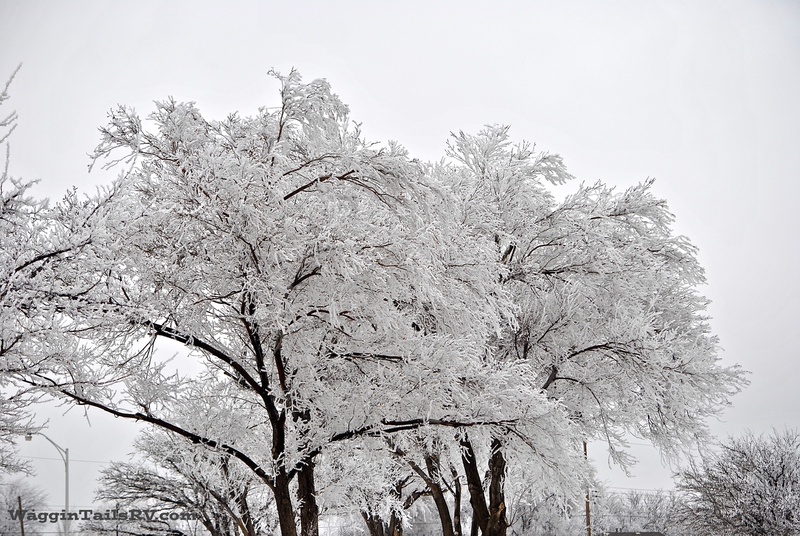 Amarillo had experienced several days with below freeing temperatures. This caused surface freezing. The humidity level rose to 96% which produced excess moister in the air. The water droplets then froze on contact with the frozen surfaces. Rather than producing a thin layer of ice, which would have occurred had the surface temperature been above freezing, the water droplets produced a crystalline structure. 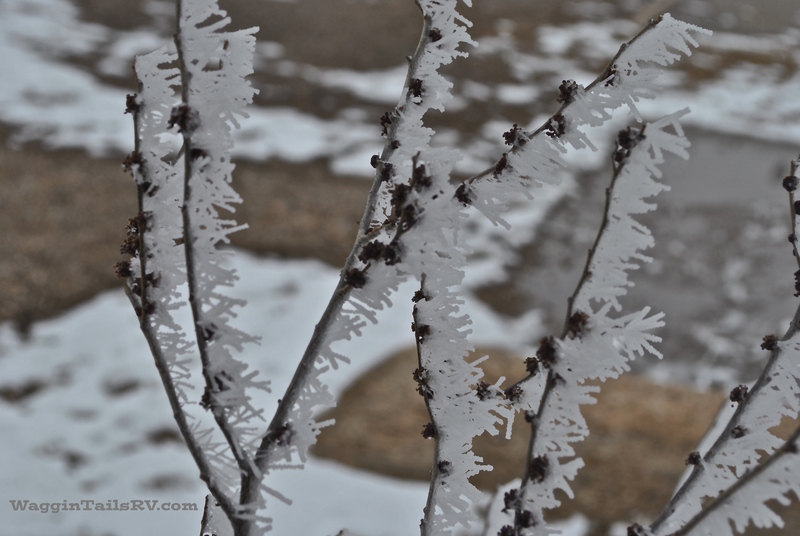 I was able to capture the beautiful scenery before the air temperature rose above freezing. Click the first image to step through full size photos. I hope you enjoyed viewing the photos as much as I did by seeing God’s artful creation. I’ve fallen of the blog wagon. It’s been two months since I last posted and I’ve been trying to figure out how to catch up. Best solution seems to be start with something current and sprinkle in the past. Five days ago, I noticed a wet spot near one of our RV sites. Wet spots are not a good sign unless there was a recent rain or a camper washed the front end of their RV. Neither of these scenarios applied to this wet spot. Over the past several days this wet spot grew from about 12″ in diameter to about 10 feet in diameter. Yesterday, we dug into the wet spot and found what a cavity that was full of water. We drained the cavity and hoped for the best. The cavity quickly filled with water. Time to dig a deep hole to figure out why there is water here. My work bud, David, is experienced in running the back-hoe while I am experienced in getting into the hole to fix the leak. On the left is a PVC coated steel pipe – on the right is a standard PVC pipe. The two pipes were connected with a coupling that is not supposed to leak. In this case, the coupling leaked. 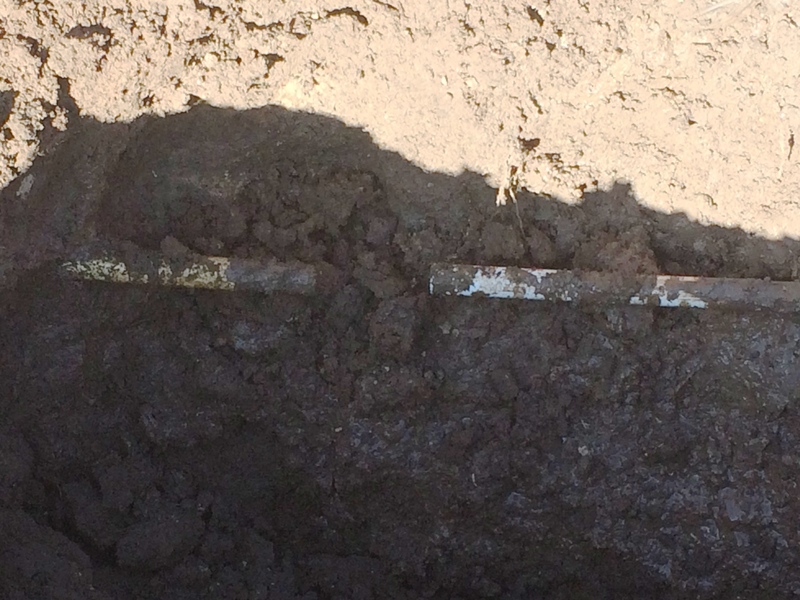 We figured this happened because the PVC flexed while the steel pipe did not. A better solution would be to have solid connection between the two pipes. 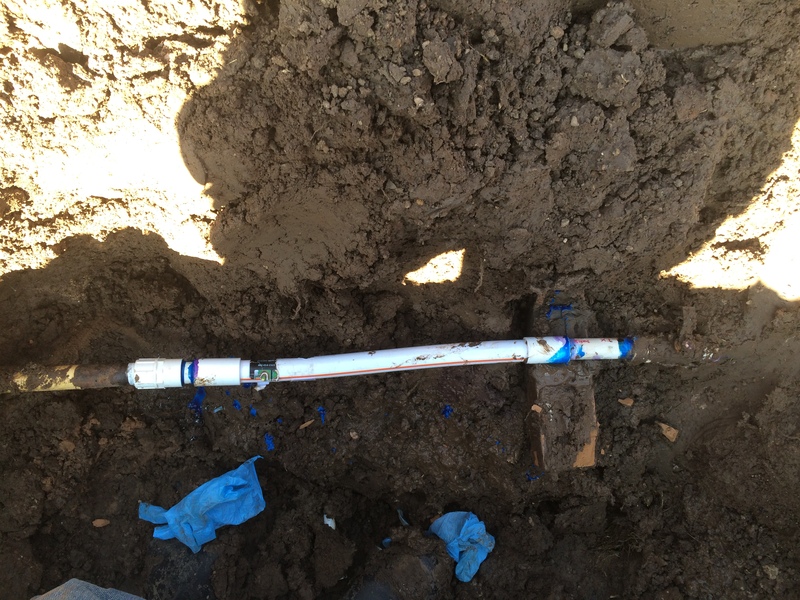 We also included a short piece of flex line so the PVC could flex under ground and not break the connection to the steel pipe. Once everything was glued and the glue had a chance to set up, it was time to turn on the water and test our fix. We were fortunate to find a water cutoff valve about 3 feet away from the leak. I gently turned on the water valve to pressure up the line. 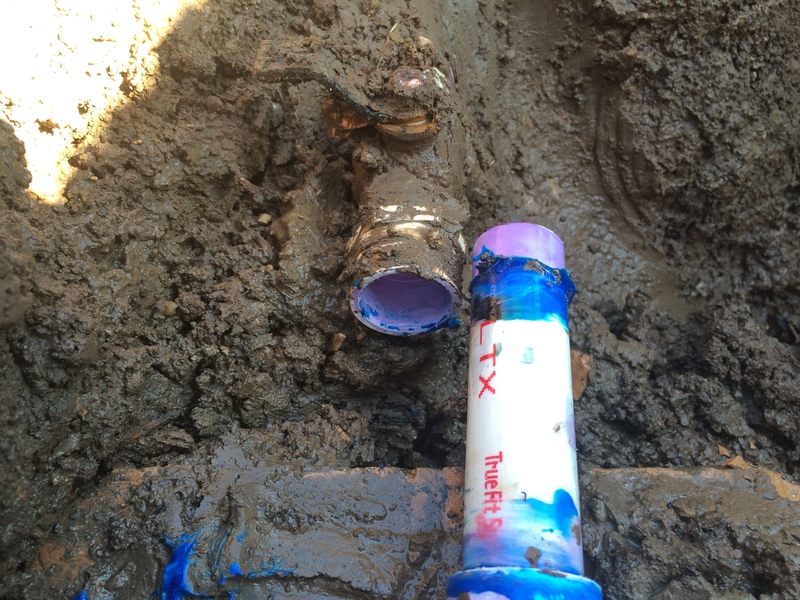 Within a minute, the connection between the PVC and valve came apart. From the looks of this, it appears the glue did not chemically weld the pipe into the fitting. 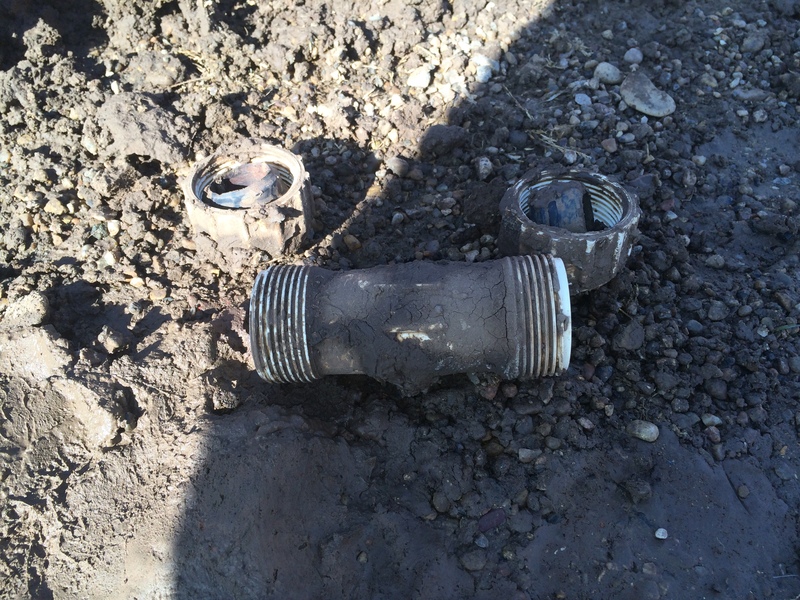 After replacing the fitting on the cutoff valve, we were able to get a secure connection. So here is what the weakest link looks like. This is called a Mueller Coupling and is easy to find at Lowe’s or Home Depot. While it can be used to connect PVC and Steel pipe, I do not recommend this because it is prone to leaks. Well, there you have it. My most recent project. This is the fourth water leak I’ve fixed since we’ve been here. We are off for the next couple of days so I think we may finish our Christmas shopping and do a little sight seeing. Thanks for stopping by. Y’all come back now.